For this reason, it’s always wise to have a plumber that you know and trust. Wondering what a Burbank, Illinois plumber can do for you? Read on to find out! Pipes can burst for a number of different reasons. Sometimes they freeze. Sometimes they’re impacted by shifting soil. Sometimes they’re subjected to exceedingly high water pressure. In any case, if your pipes burst, you will need to have them fixed as soon as possible. It is extremely difficult for a home or business to function properly with working plumbing. Any reputable plumber will be able to fix your burst pipes in a timely and professional manner. Do you have a basement in your home? If so, it may be prone to flooding. While you can’t entirely eliminate the chances of basement flooding, there are some things you can do to reduce the chances: you can install anti-flooding entities. Sump pumps, flood control systems, and other entities can help to reduce water buildup in your basement. Interested in utilizing such entities? A licensed Burbank plumber can supply and install them for you. Over time, sewer lines become more and more inundated with muck and grime. At some point, they will become so inundated that they fail to function at optimal capacity. At this point, they will need to be cleaned. Looking to clean your sewer line thoroughly? Your best bet is to call in an experienced plumber. Through the use of rodding and hydro jetting techniques, a plumber can make your sewer line look like new. In the long term, unidentified water leaks can cost you a lot of money in terms of damages. These leaks are caused by everything from pipe corrosion, to loose pipes and more. If you think your plumbing system is experiencing a leak, but you’re having trouble locating it, you should call up a plumber. Our plumbers are highly experienced with plumbing leaks, and are adept at identifying the sources of them. Clogs come in all levels of severity. In many cases, these clogs can be removed with liquid drain cleaners and snaking tools. In more severe cases, however, plumbing components will need to be disassembled to get to the root of the problem. 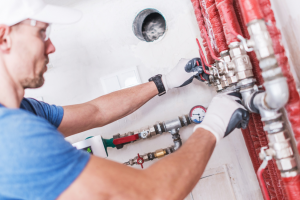 If you don’t feel comfortable disassembling your pipes and other plumbing components in order to remove a clog, you should call in a plumber. A professional plumber will locate the position of the clog, disassemble your plumbing, remove the clog, and put your plumbing back together again, all in a timely manner. Perhaps you’re looking to install a new toilet? Maybe you’re hoping to install a new sink? In any case, if you’re thinking about installing a new water appliance, you should consider utilizing the services of a Burbank plumber. The installation of water appliances is a delicate process. If done incorrectly, you could face a variety of plumbing issues. A licensed plumber will ensure that your appliance is installed in the optimal manner. In Need of a Licensed Burbank Plumber? Perhaps you’ve encountered a few clogs with your plumbing system? Maybe you need new appliances installed? In any case, you require the services of a Burbank, Illinois plumber. Looking for such a plumber? AE Power, Plumbing, Heating, and Cooling has you covered. Our team of highly-skilled and certified plumbers is beyond experienced in all of the tasks reviewed above. Contact us today to discuss your plumbing needs!